While digital computation methods have increasingly been incorporated into the architectural and industrial design process, their use in landscape architecture and terrain modelling is relatively nascent. 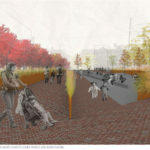 This project is an example of the potential application of computation-driven geometry to the design of physical landscapes, in this case enabling the redesign of an urban park in a historical district which eschews pastiche while retaining echoes of the past. At a smaller scale, embedded in this project is a material reinterpretation at the interface and transition between hard and soft surfaces. The material reinterpretation is a subtle provocation of what defines modern materials, how these materials are configured and in what context, and how contemporary geometries can be created using materials that are normally thought of as traditional. 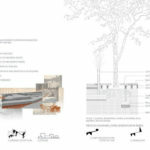 Overall, the project offers new possibilities in terms of form, performance and social occupations of public urban space. The Esplanade was formerly part of Toronto’s bustling harbour and was characterized by railway lines, wharves and industrial buildings. Located in Old Town Toronto, this site is nestled between the historic St. Lawrence Market and the revitalized Distillery District while the immediate neighbourhood is known for being one of the most successful examples of public housing projects in North America. The site in question is an approximately 40 x 220 metre block flanking the south side of The Esplanade and comprising a park with a standard issue playground. More than simply producing a pastiche of past styles, the design of the new Promenade Park reinterprets traditional building materials and urban topographies to create a sophisticated urban park for visitors of all ages throughout the day. 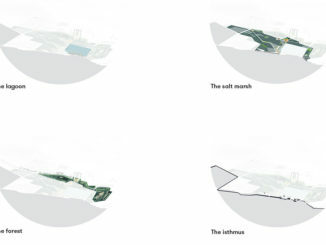 Digital computation was used in Rhino to create an abstract prototype, the geometry of which was translated onto the site to generate a new topography, non-linear circulation and resultant urban site design. A cross section of the prototype was used to articulate new formal possibilities at the intersection of hard and soft surfaces. 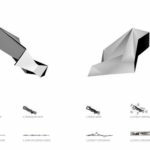 These formal possibilities were then taken up by a material reinterpretation that saw traditional materials take on new directionalities, slopes and applications. Toronto is built on a grid with few places to stroll, and the new design creates a unique place where people can meander and the area can live up to how Old Towns are used in other cities. By imposing a strong triangular geometry on the site, very distinct spaces are created, as is a non-linear internal circulation pattern, both of which extend the space and time experienced despite this being a small, narrow park. 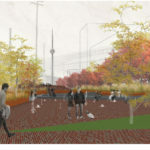 The railway lines of the past are reimagined to create a wooden boardwalk along The Esplanade, honouring its past as a major thoroughfare and translating it into an urban avenue that connects the Distillery District to the St. Lawrence Market, elevating The Esplanade’s use and how it functions in the contemporary, urbanized context. The boardwalk normally associated with park, waterfront or historical settings is here used in an urban context, and now provides expanded areas for tree growth and redefines urban forestry typologies. On the west is the Grassy Knoll Viewpoint, a gentle hill translated in the language of the new geometry, which offers an open vantage point of the CN Tower. 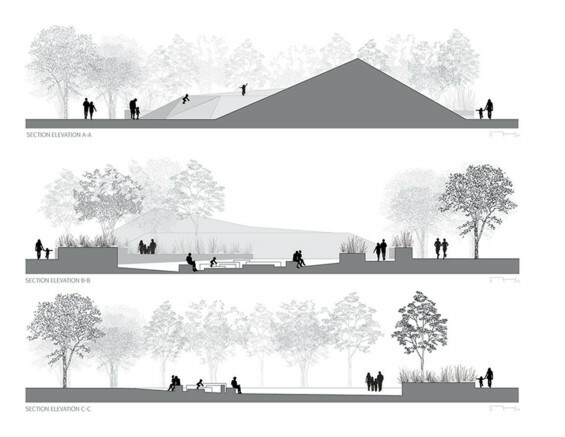 What follows is the more pronounced, pyramidal topography designed as the primary play space. 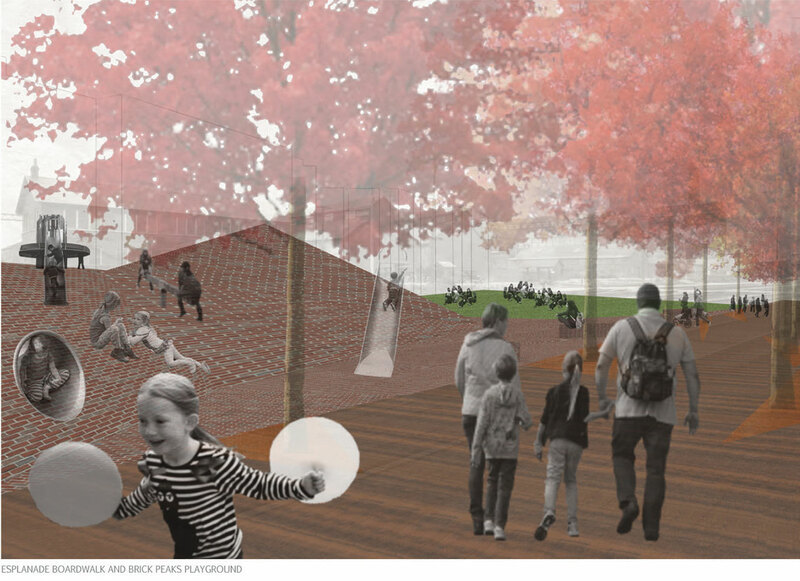 Brick Peaks Playground, which has opportunities for playground furniture and seating for parents when children are playing or eating items purchased at St. Lawrence Market, challenges notions of what materials can be used for playgrounds and in what configurations. 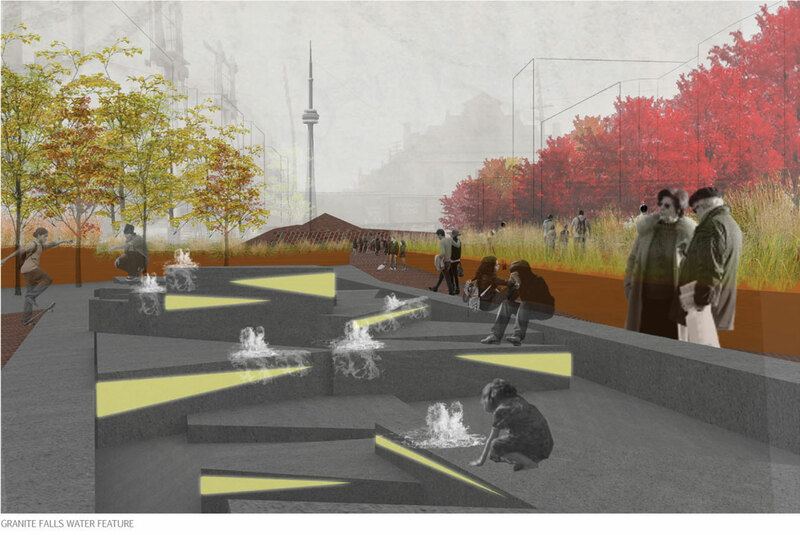 In the centre of the site is the expansive Granite Falls water feature that is a nod to the site’s former location at the shore of Lake Ontario prior to infilling during the 1920s. The water feature, one metre below grade, can be reached by way of gentle ramps (under 5%) between cast iron planted retaining walls. 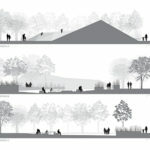 The topography in this part of the park is subtle and gentle; the design consciously keeps the slopes shallow and avoids the use of steps for reasons of accessibility, but also to encourage the experience of comfortable strolling. 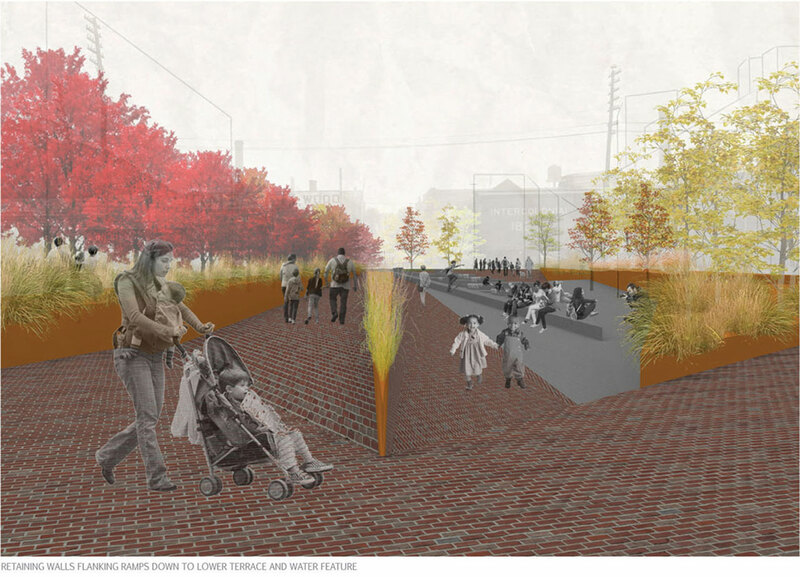 The planting of tall grasses amplifies the sense of a change in height while acting as a screening device and creating distinct spaces within the park. The minor grade change ensures safety and visibility while in the middle of the park, but is enough to create a different atmosphere. The Granite Falls water feature is shallow and occupiable, so teenagers or adults can sit around informally, people watch or gather, and children can climb on it and use it as an additional play space. The lighting on the water feature signals that the space is to be used at night in a way that integrates with the rest of the neighbourhood; people can have dinner or drinks in the Distillery District and then go for a stroll and sit around the water feature. 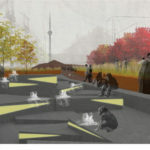 To the east is Toronto Plaza, which slopes gently toward the centre of the park and includes a seasonal water feature. 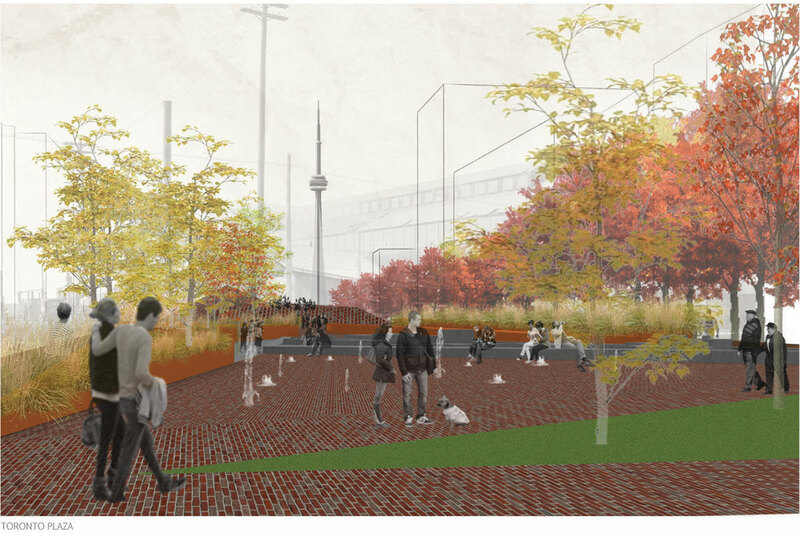 Coming from the Distillery District, visitors would see the plaza, which has the potential to serve as a spillover area for festivals in the Distillery District, and have the option of promenading toward the centre of the park, or continuing straight along the boardwalk. Toronto Plaza’s seasonal, intermittent water jets invite visitors to slow down to walk around them, or for children to play around them while making their way slowly to the water feature. Brick is the unifying element between the distinct programming areas and is reconfigured into play spaces and paved surfaces that are dynamic in their geometry but have a slowing effect due to their texture, inviting visitors of all ages to stay in the park as long as possible. Where the brick is at grade, it runs orthogonally; where there are slopes moving toward the water feature, it takes on different angles. The paving patterns have a directionality to them and are a translation of the strong geometry of the plan, onto the ground plane. 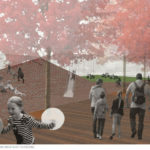 An allée planting pattern of sweetgum trees supports the linear tract that is the new wooden promenade and is used as the basis for the rotated grid planting over the remainder of the site. Other species used in the park include alternate leaf dogwoods, birches and poplars. 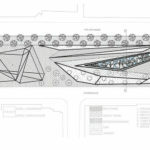 Promenade Park connects to its surroundings and history through a reinterpretation of urban topographies and traditional materials. It serves a city-building function by connecting the St. Lawrence Market and the Distillery District, and provides a special experience not only for the immediate community, but also for visitors from Toronto and beyond.